Two weeks ago there was a Meeting of the Noses in Portland, Oregon. After knowing each other via Now Smell This and emails for almost !12! years, Angela and I finally met face to face. (And I'm happy to report that Angie is as witty, kind and charming in person as she is in her writing. Okay, add a dash of lighthearted roguery, as well!) One other nose was involved in our meeting, too — raconteuse Tracy Tsefalas of the Portland perfume boutique Fumerie. I forgot how much fun it is to discuss the Perfume Industry with fellow travelers. On the shelves of Fumerie, I was thrilled to discover some hard-to-find Ortigia products. 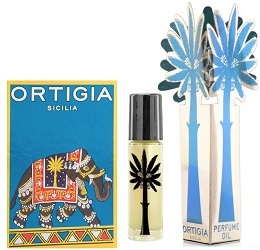 Ortigia was founded by Sue Townsend of Crabtree & Evelyn fame. After selling that company and retiring to Sicily, she got bored and decided to start a new company. The name "Ortigia" has Greek origins and means "quail"; it's also the name of an island in Siracusa. 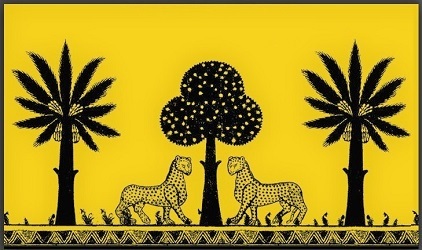 Ortigia's logo of two leopards is taken from Byzantine mosaics inside the Palazzo dei Normanni in Palermo. Townsend hired Lorenzo Villoresi to assist her in the creation of the scents for her Ortigia toiletries. Today, I'm reviewing Sandalo Eau de Parfum,* one of 12 Ortigia fragrances. Sandalo opens with an interesting aroma: whiskey; then, dark, "oily" sandalwood comes to the fore and mixes with narcissus, vetiver and an airy teak scent. Cedar, wisely, is kept in the background so it won't compete with sandalwood. Sandalo's base smells of "narcissus-tinged" leather and dry, dusty sandalwood. Sandalo has a retro/dressy-casual vibe and immediately went on my to-buy list. If you ever smelled Crabtree & Evelyn Indian Sandalwood Cologne,1 you'll detect a resemblance in the sandalwood notes used in Sandalo, even though its additional notes are different. Please comment if you've worn other fragrances from the Ortigia line. I'm especially intrigued by Ambra Nera, Sicilian Lime, Mandorla (Almond), Coral Shell and Pomegranate. Ortigia Sandalo Eau de Parfum is available in 30 ml ($65), 100 ml ($130), and a 10 ml roll-on ($24) — available in the US at Fumerie and Londons. 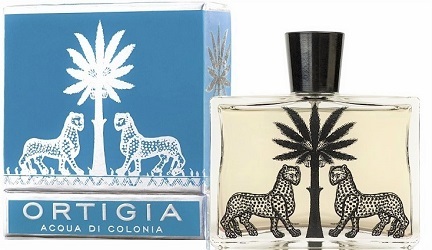 Ortigia will ship to the U.S. from its Italian (Florence) headquarters: there's a €20 shipping fee but shipping is free on orders over €250; alas, if you order perfume, deemed a "dangerous substance" due to its alcohol content, shipping rises to €45 (no free shipping applies). If you live in Europe, your luck in finding the full range of Ortigia products greatly increases. *Listed ingredients of sandalwood, narcissus, cedar, teak, vetiver, rose and jasmine. 1. Crabtree & Evelyn Indian Sandalwood Cologne no longer appears on Crabtree & Evelyn's website; it may have been discontinued. Portland in the house – wahoo! I love visiting this site every day. Cindy: yep…I’m a fan of Portland; easy to visit from Seattle. Great review!! I have been eyeballing Mandorla for the almond note not that long ago. choco: I know…I have to get my mitts on the perfume samples for these. I bought a wee bottle of Mandorla last summer when visiting Fumerie with Foxbins (place-dropping AND name-dropping!). It is an amiable, somehow tropical scent, so not a strict almond soliflore. Oh my. I might have to line up a purchase for the packaging alone. The artwork is fantastic. Love the packaging and bottles of this one. Too bad it’s not an easily accessible brand. floragal: I know! I was hoping I’d have more luck in Canada but the situation there is like the U.S. Another reason to visit Europe…. Love this brand and the packaging is beautiful.It’s currently only sold at the weirdest place ever,in South Africa:a deli/bakery/coffee shop in Hyde Park called Tasha’s.along with random throws,incense and artisanal deli-foods. johanob: that’s just the sort of place it’s sold in Vancouver BC, too! jjlook: looks like the only place in Vancouver now is this; you may want to email or call before visiting to see what they have in stock — they most likely don’t carry the entire range. Very cool — and even the little rollerballs have a nice design (although no leopards)! FYI — Luckyscent has Ensar Oud’s real, old sandalwood oils now. They are heavenly. noz: yikes…I’ll go look now. I see some Ortigia products on Amazon through a third-party seller. Also, Parfum1 has the bath salts, and (as I just found out when I placed my order) their current 25% off promo applies (code’s on the website). I am so sorry I did not get to meet the two of you! But I am glad you guys went to Fumerie, a wonderful space! I really like Sandalo and Ambra and got the glycerin soaps and rollerballs, which lasted all winter. Bonus: the soaps are very clean rinsing and softening. Ede: Is “Ambra” a “classic” amber perfume? Or? That bottle is so beautiful. What’s inside sounds really nice, too. MC: and the bottles are big and hefty. There is a powdery peppery sweetness to it that is very pleasing- not as sharp as say Prada.